As we all prep to head back to school for spring semester, some folks might be gearing up to write (or continue to write) their senior thesis. Lucky for you all, I just finished mine (and did pretty well on it, if I do say so myself). Writing my senior thesis was really stressful for a lot of reasons, but mostly because this is such a freakin’ beefy project. I’d done lengthy research papers before (thesis proposal, senior seminar [which I took as a junior…?]). Because of all of that, I was able to really kind of figure out what I wanted to do in terms of organization for the project. Since my senior thesis was so important to me (it was the #1 thing I was thankful for this year), I really wanted to knock it out of the park and do something great with it. I knew that since it was so much research, I was going to need to be so so organized. So what was my thesis even about? My senior thesis was entitled, “The Implicit Imperialists: The Disnification of American Hegemony 1990-1991.” I took a look at the relationship Disney has with the U.S. government and how, for better or for worse, everything we see (Disney cartoons included) serves as some sort of propaganda. I also looked at the history of American primacy, otherwise known as “orientalism.” This refers to the way the West perceives the East as kind of subhuman, like the way colonial powers in the late nineteenth/early twentieth century justified going into Middle Eastern countries and sort of imposed Western conceptions of freedom and civilization on them (but we have to ask– who made up these ideas of freedom/civilization?). In the end, I kind of weave this all together to make sense of the First Persian Gulf War and the depiction of Arabs in Aladdin. It probably sounds boring to you, but I promise, it was awesome. I tell you all this just so I can show you how many different components projects like this have. 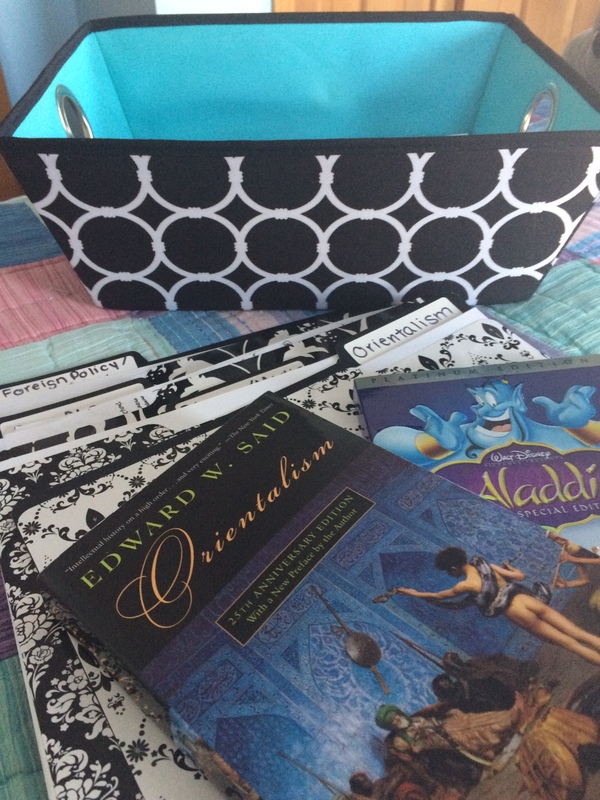 For me, I had: the study of Orientalism (I read a lot by/about Edward W. Said), history of U.S. foreign relations, Cold War and Gulf War readers (big books filled with primary documents), the study of Disney, the study of media analysis, and the study of Disney with regards to history. I organized all of my research accordingly. So I decided to take all of those research topics and split them into different file folders, and decided I’d store all of those folders into one box. You can, of course, make these folders on your computer and store everything digitally, but personally, I’d prefer to highlight and take notes on the hard copy of a journal article (if you do store things digitally, every single time you do something, back it up on a flash drive in case, heaven forbid, something get lost). When I read books, I would read the book and type out notes on my computer (I used an interlibrary loan program, so I wasn’t allowed to highlight the actual books.) 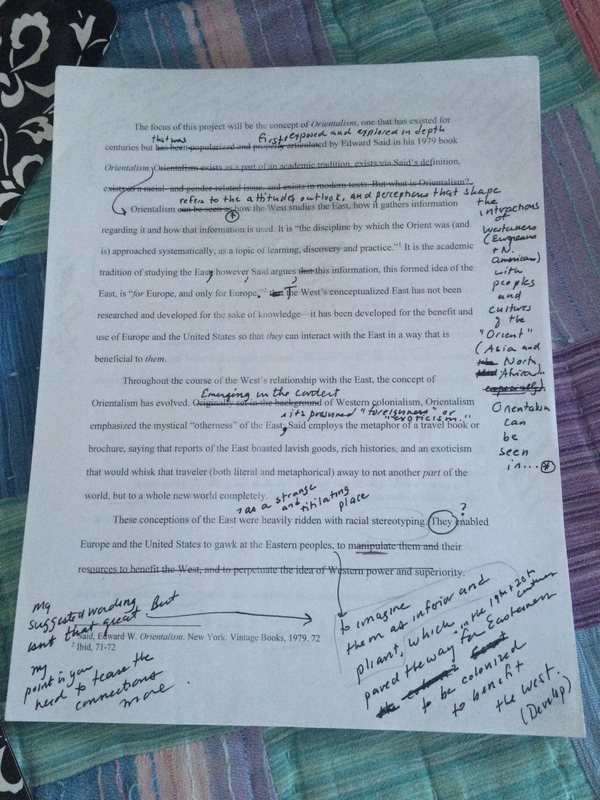 I took note of different direct quotes I wanted to use, or I paraphrased ideas– mostly I transcribed actual quotes, though, because I figured I could always go back and paraphrase, but if I’d returned the book, I couldn’t get the quote again. I printed those out and put them in folders, too. 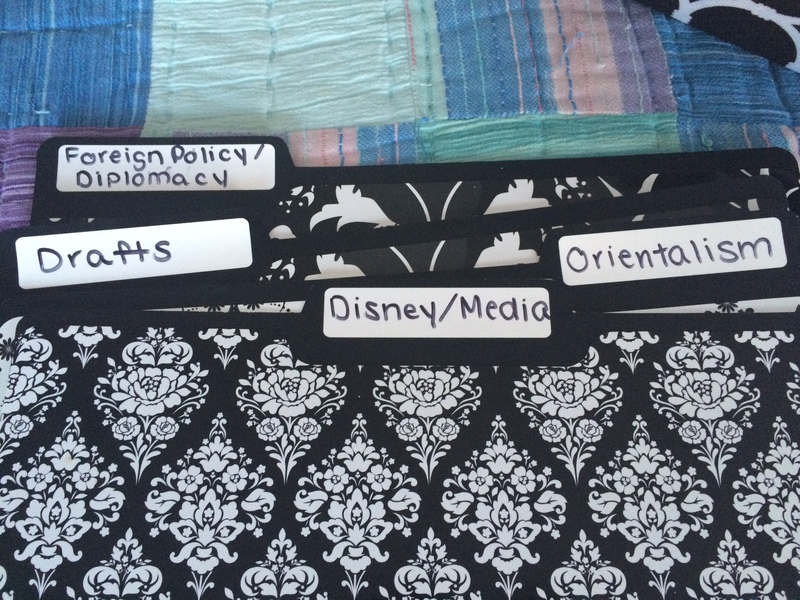 The folders were labeled: media analysis, foreign policy, orientalism, and Disney history. I also had a folder for all of my drafts. …and that was just my introduction. As the project continued, the pages got less and less messy, but even now, after I’ve submitted my final copy for publishing, I’m sure there are so many things she could find to improve. I wanted this because frankly I spent hours on the project and I’m submitting it for awards and I want to win those freakin’ awards (woohoo for extrinsic motivation!). A note about defending: What is a thesis without a defense? I’m a petrified public speaker, even though people always say they’re surprised by that (I think it’s because my voice projects). My goal for my defense was to make it basically like a TED Talk, and while I totally did not achieve that (although, TED, if you want me to talk, I am SO DOWN. #pipedream) I think I did a nice job. Something that made a huge different was using Prezi. Prezi was so simple, free, stored everything in a dropbox type thing on its website, and had clean yet interesting animations. I got so many compliments on my Prezi, so I definitely suggest you give it a try. I also super suggest taking a video of yourself doing your presentation. I did mine in the Provoc office where I could set up one of our computers with my Prezi and use the other to take a webcam video of myself (note to self: delete those before the staff comes back to school). This helped me notice stupid crap I do when presenting, let me hear where I stumbled over words, found certain phrases that worked and used them in the actual presentation, and let me time myself. 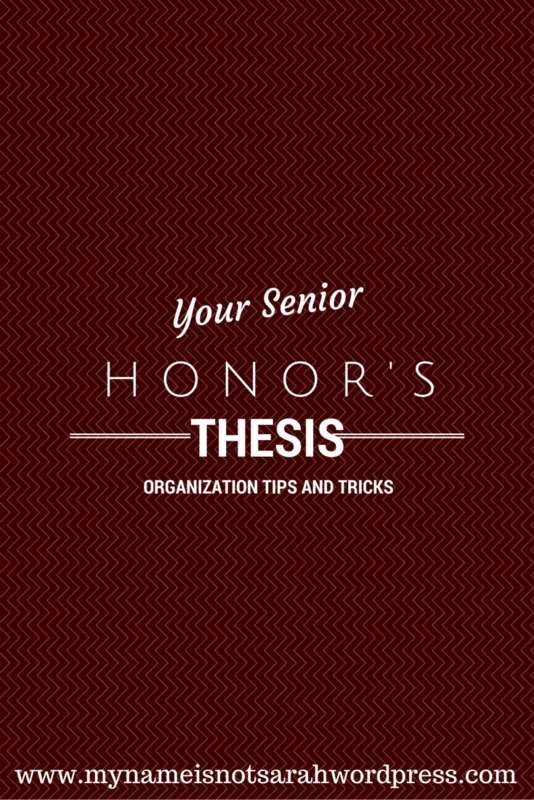 Do you have a senior thesis coming up? Do you have suggestions on how to make it work? Let me know in the comments below! I’d love to hear from you!